Recycling is an essential part of her life. Valeria Thomas, French artist,passionate of melted plastic , began working with plastic bags in 2002 with the challenge of making “something” with the many bags that can not be recycled and are declared “public enemy No.1” for the environment. And after a few trials with the iron… it melts. And it’s beautiful! Valeria then splurged into the creation of small objects, starting with jewelry, then larger pieces, then assembling them with the sewing machine, welding them, molding them. She creates fashion accessories,house decorations and real pictures. 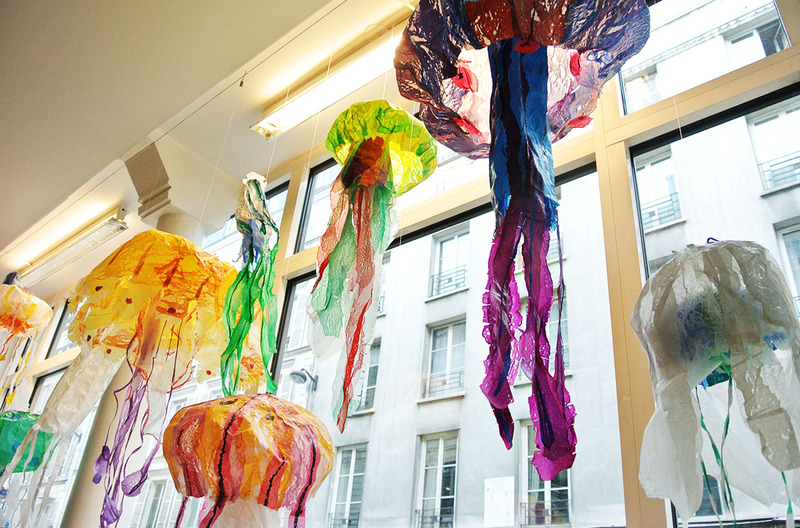 Her latest creations are sculptures of jellyfish, with this wonderful material. A network of supporters has formed around her project in the city of Les Lilas (near Paris) where she lives. She collects bags sorted by color, cutting them, composes and overlaps and melts them with the heat of the iron! The resulting surfaces are bold colors , graphic. Renewing her original profession : textile design. Today, plastic bags are rarer in France, it’s true, and that’s good for the environment! However, ValeriaThomas still has a few years of recycling ahead of her… And when they disappeared completely ? She will do something else! La récup fait partie de sa vie depuis toujours ! 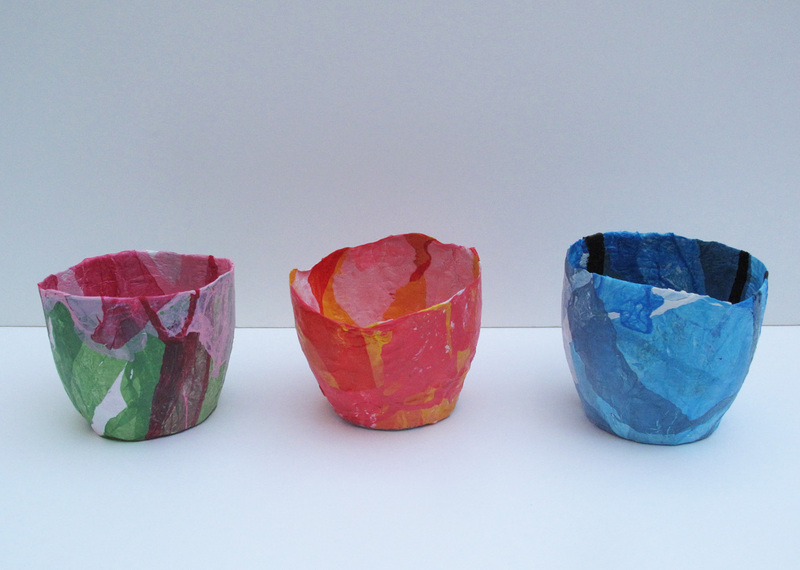 Valéria Thomas, artiste française, passionnée de plastique fondu, commence en 2002 avec le défi de fabriquer « quelque chose » avec les nombreux sacs plastiques qui, non recyclables sont déclarés « ennemis publics n°1 » pour l’environnement ! Et après quelques essais avec un fer à repasser… ça fond. Et c’est beau ! Valéria se lance alors dans la création d’objets de petite taille, à commencer par des bijoux. Puis des surfaces plus grandes, modelées ensuite en les cousant, en les soudant, les moulant. Elle réalise alors des accessoires de mode, de décoration, puis de vrais tableaux. À présent, ses dernières creations sont des sculptures de méduses, avec ce merveilleux matériau. Un véritable réseau se forme autour de son projet dans la ville des Lilas (près de Paris) où elle habite. Elle récupère des sacs qu’elle trie ensuite par couleur, découpe, compose et superpose, puis fais fondre à la chaleur d’un fer à repasser ! Les surfaces obtenues sont solides et naturellement colorées, graphiques. Ainsi elle renoue avec son métier d’origine : le design textile. Aujourd’hui les sacs plastique se font plus rares, c’est vrai, et c’est tant mieux pour l’environnement ! Cependant, Valéria Thomas a encore quelques belles années de récup devant elle… Et lorsqu’ils auront totalement disparu ? Elle fera autre chose ! These statistics about the condition of women artists in Korea are taken from 2 research papers in 2007 and 2010; Artists compared with total workforce, gender ratio of artists, percent of Korean Artists Who Are Female, age-specific employment by gender, and the average monthly income by gender. If you see these statistics, you will find women artists in Korea need help, similar to the U.S, and understand their condition. In Korea, Economically active population is 39,598,000. 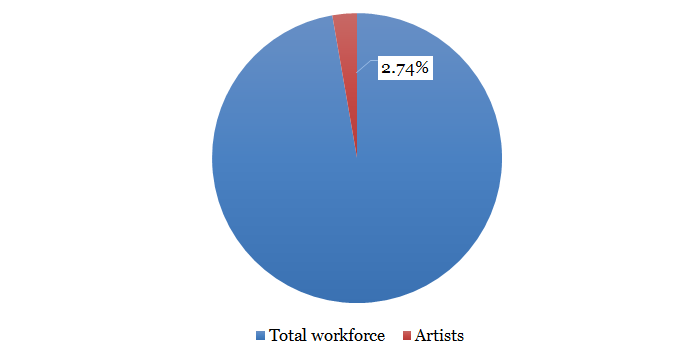 The total workforce is 23,749,700 and artists are 651,736. In the field of arts, the proportion of women in the arts is 42%. The highest percentage, 86%, of female artists is translators. (In Korea, translators are considered artists.) Fashion designers were second, followed by writers and authors. Only 9.2% of Architects and 12.7% photographers are women. 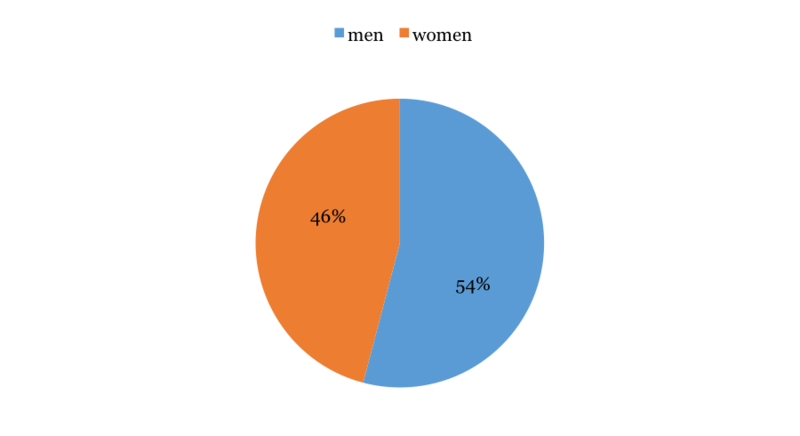 This graph shows the percentages if the total of male artists and female artists is 100 respectively. The proportion of female artists begins to decline significantly after 20s. On the other hand, male artists are widespread in 20s to 50s. It shows that it’s hard to survive in the workplace as a woman in Korea. This graph shows the percentages if the total of male artists and female artists is 100 respectively. The average monthly income includes wage and extra income. Female artists are predominantly underpaid. The percentage of high-income women is very low. It shows that there is still a gender wage differentials in Korea. Female artists, on average, earn 69% of what a male artist would earn for the same work. The difference in monthly income between men and women is 1165.5 dollars. 2010 Statistics of Artists in the workforce by Gender DB (2010성별문화인력통계DB), 2010, Ministry of Culture, Sports and Tourism, Republic of Korea. Statistics about female in film industry in U.S. These statistics about the condition of women in Film industry are taken from 2 research papers in 2013 by Martha M. Lauzen, Ph.D.; The Celluloid Ceiling: Behind-the-Scenes Employment of Women on the Top 250 Films of 2013 and it’s a Man’s (Celluloid) World: On-Screen Representations of Female Characters in the Top 100 Films of 2013. The first research paper has tracked women’s employment as directors, writers, executive producers, producers, editors, and cinematographers working on the top 250 (domestic) grossing films for the last 16 years. The second research paper reports the findings of a content analysis of over 2,300 characters appearing in the top grossing films of 2013. From 1998 to 2013, men employed in Key-Behind-the-Scenes Roles have been over 80%, on the other hand, women accounted for less than 20%. In 2013, women comprised 16% of all directors, executive producers, producers, writers, cinematographers, and editors. 6% of directors, 10% of writers, 15% of executive producers, 25% of producers, 17% of editors and 3% of cinematographers were women on the top 250 domestic grossing films of 2013. 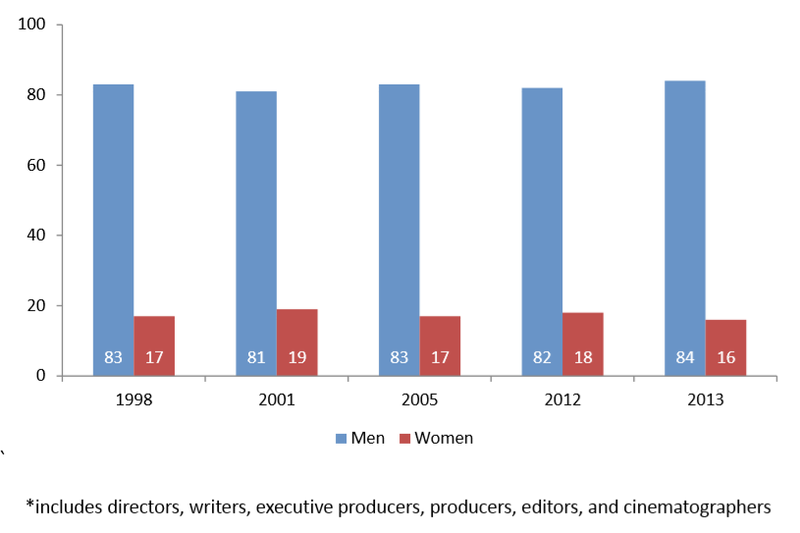 A historical comparison of women employment in 2013 and 1998 reveals that the percentages of women directors, writers, executive producers, editors, and cinematographers have decreased. The percentage of producers has increased slightly. 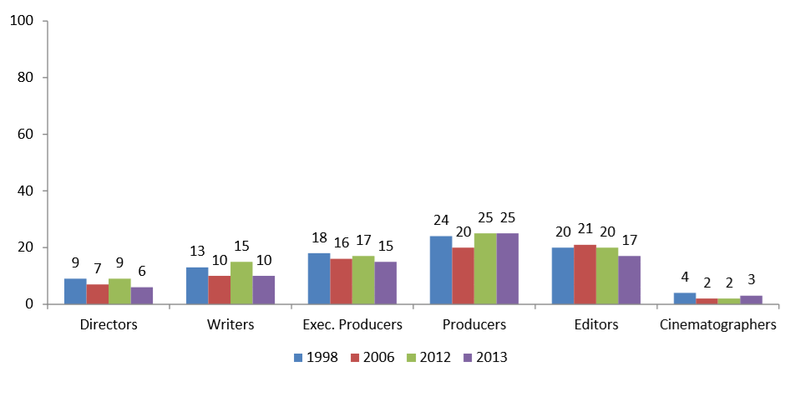 A historical comparison of women employment in 2013 and 2012 reveals that the proportions of women directors, writers, executive producers, and editors have declined. The percentage of women producers has remained the same. The proportion of women cinematographers has grown slightly. According to the second research paper, female characters remained dramatically under-represented as protagonists, major characters, and speaking (major and minor) characters in the top grossing films of 2013. Females comprised 15% of protagonists, 29% of major characters, and 30% of all speaking characters. Only 13% of the top 100 films featured equal numbers of major female and male characters, or more major female characters than male characters. In 2013, only 15% of all clearly identifiable protagonists were female (up 4% from 2011, down 1% from 2002), 71% are male, and 14% are male/female ensembles. 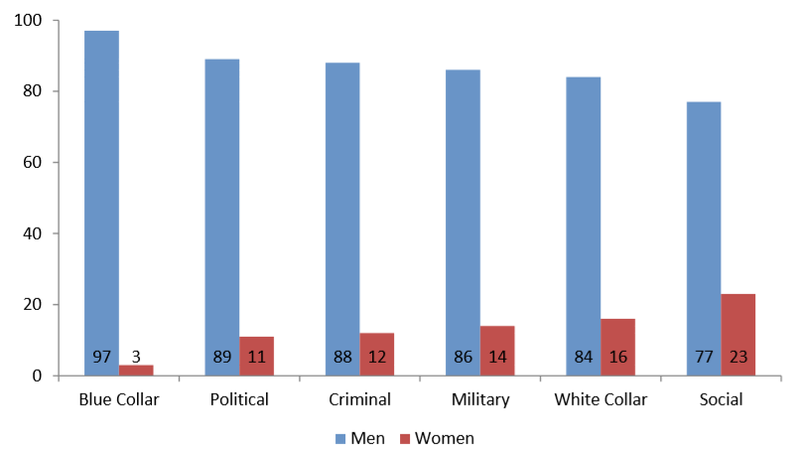 In type of leader, women comprised 3% of blue-collar leaders, 11% of political leaders, 12% of criminal leaders, 14% of military leaders, 16% of white-collar leaders, and 23% of social leaders. Statistics about female in the art and culture industry in U.S. These statistics about the condition of women artists in the U.S. are taken from 2 research papers in 2005-2009 and 2011; Gender Ratio of Artists, Percent of the U.S. Artists Who Are Female, Median Wages and Salaries by Artists Occupation, Median Wages and Salaries of by Gender and Artists Occupation, Median Wages and Salaries of Full-Year/Full-Time Artists by Gender. If you see these statistics, you can see the difference between female and male artists. Also, you will find women artists in the U.S. need help. Similar to the total labor force, the proportion of female artists is 46%. The highest percent, 77.9%, of female artists is dancers and choreographers. Writers/authors were second, followed by Designers. Only 21.2% of announcers and 24.9% architects are women. The two of best-paying artist occupations are architects and producers/directors; men compose 75 percent and 63 percent, respectively. 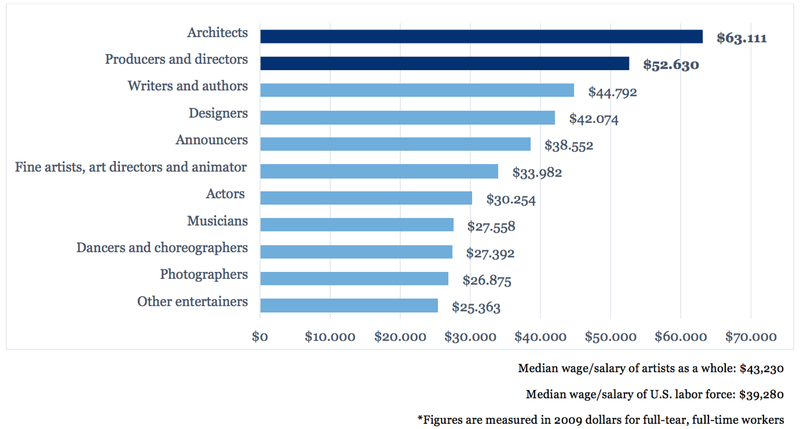 Among actors, architects, dancers/choreographers, designers, fine artists/art directors/animators and photographers, women earn 74~81% of what a male artist would earn for the same work. Only women musicians and other entertainers earn a little more (by $0.02 per dollar) than men. Female artists, on average, earn 81% of what a male artist would earn for the same work. The difference in median wages and salaries of full-year, full-time artists between men and women is 8,923 dollars.